Following the hugely successful bijin-tokei(beautiful girl clock) and the recently launched binan-tokei(cute guy clock), GAL-tokei(Gal Clock) launched today on December 3, 2009, featuring 360 gals (or gyarus) to tell you the time. The pictures were all shot in "Gal's Sanctuary" Shibuya where the gal-cultures evolved, so you can keep up with what's in and out now among Japanese gals, fashion, makeup, hairdo and stuff. GAL-tokei (Gal Clock) official website / English Ver. 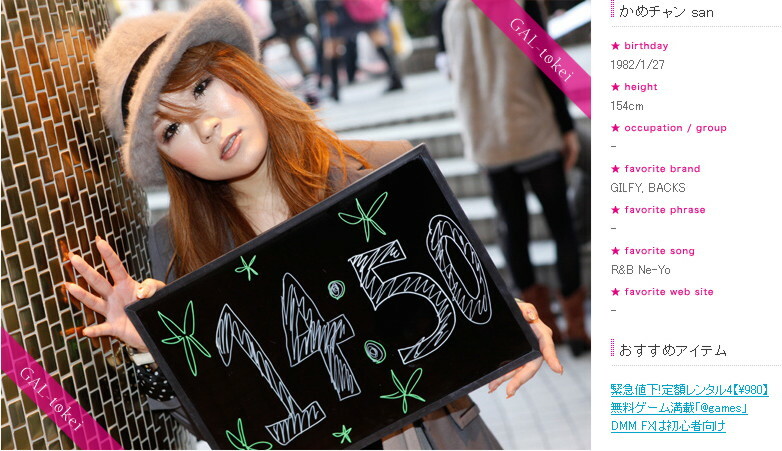 "GAL-tokei" is a clock site composed of 1440 girl photographs,who gathered in Shibuya. The photograph changes automatically every minute to indicate the time. That is one part of modern japanese culture, throuph their "fashion, make-up, hairstyle"
The girls hold a little chalkboard with the current time written on, different girl for every minute of the day. This is Yuichi. Kame-chan's favourite music is "R&B, Ne-Yo". Ayano also loves R&B as well as Reggae, Gal-ish taste of music, you can say. Mii, highschool senior. Her favourite phrase is "Mendoi" (informal Japanese, something along the line of "I can't bother"). Shiori's favourite singer is Ayumi Hamasaki. Mayu. Many gals are photographed making peace signs. Retchi. Gal-style varies, you can wear a baseball cap with geeky oversized glasses (just like Arale-chan from Dr. Slump) and still be considered a gal. "GAL-tokei" launched just today and the site seems to be having a bit of trouble handling the heavy traffic right now, but they've also got a "GAL-tokei" google gadget and iPhone app.